Samsung has prepared a series of new Exynos System-on-Chip processors for this year, attending both mid-range and high-end segments. Firstly, there's the Exynos 5 Octa 5422, which is nothing more than a higher-clocked version of the 5420 chip introduced last year (and seen on devices like the Galaxy Note 3, Note 10.1, as well as the Galaxy Tab Pro, Note Pro, and Tab S range of tablets), then there's the first processor in the Exynos 5 Hexa series, the 5260, which, as its name suggests, has a total of six CPU cores. 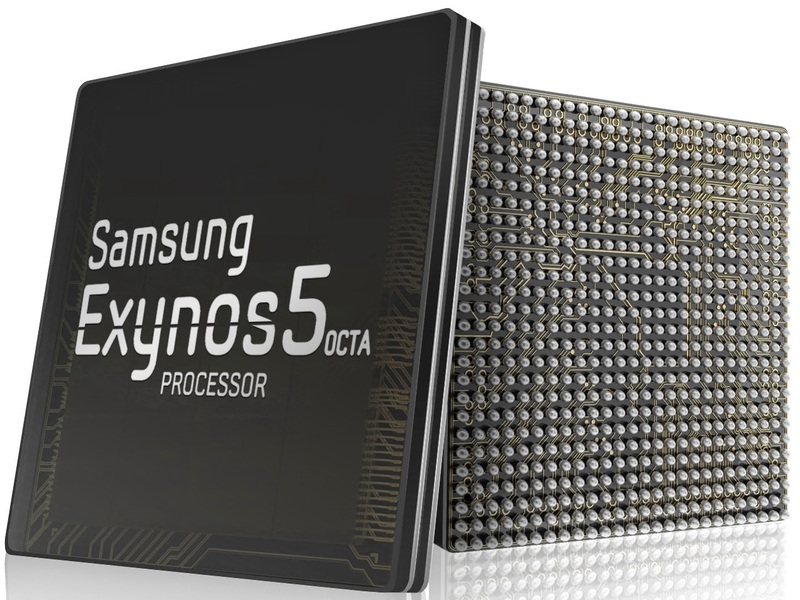 Finally, there's the Exynos 5 Octa 5800, which is basically a 5422 adapted for use in Samsung's Chromebook 2 13.3". The 5422 is architecturally identical to the Exynos 5420 released last year, only with higher clock speeds. It therefore consists of two CPU clusters working in a big.LITTLE configuration, one being a high-performance cluster consisting of four Cortex-A15 cores clocked at 2.1GHz, and the other being a low-power cluster containing four Cortex-A7s clocked at 1.5GHz (vs 1.9GHz for the A15s and 1.3GHz on the A7s on the Exynos 5420). The GPU is a 6-core Mali-T628 MP6 clocked at 695MHz, which gives it up to about 142 GFLOPS processing power (vs 533MHz and 109 GFLOPS for the 5420). The system is fed by a 32-bit dual-channel LPDDR3-1866 (14.9GB/s bandwidth) memory interface, same as the 5420. The increase in CPU clock speed is hardly enough to yield a noticeable performance increase, but the GPU's higher frequency compared to the Exynos 5420 is definitely a significant jump. Currently the Exynos 5422 is only available in the SM-G900H variant of the Galaxy S5. Next up is the Exynos 5 Hexa 5260, which is more of a mid-range SoC due to its lower CPU core count and weaker GPU. This processor, much like with the Exynos 5 Octa processors, has two CPU clusters in big.LITTLE configuration. The high-performance cluster consists this time of two Cortex-A15 cores clocked at 1.7GHz, and the low-power cluster is a quad-core Cortex-A7 clocked at 1.3GHz. The GPU is ARM's Mali-T624, probably in a 4-core configuration, but the clock speed is unknown and so is the theoretical compute power. However, it can be noted that the T624 has half as many execution units per core as the T628, so considering that, plus the fact that there are two less cores than inside the T628 MP6 powering the Exynos 5420/5422, you end up with about one third of the processing power at the same clock speed for the T624 MP4 compared to the T628 MP6. Finally, the 5260 SoC is fed by a 32-bit dual-channel LPDDR3-1600 memory interface, offering 12.8GB/s peak bandwidth, which is more than enough for the CPU and GPU. So far, the Exynos 5 Hexa has only made its way to two devices: the Galaxy Note 3 Neo and the Galaxy K Zoom. The Exynos 5 Octa 5800 is practically identical to the 5422, except that it has slightly lower clock speeds (2.0GHz vs 2.1GHz for the A15 cluster and 1.3GHz vs 1.5GHz for the A7 cluster) and it's adapted for use in Samsung's Chromebook 2 13.3" (and perhaps other Samsung Chromebooks in the future). There are also rumors of an upcoming Samsung Exynos chip codenamed 5433, and this chip will allegedly be competitive with Qualcomm's Snapdragon 805 processor, so if that turns out to be true I'd expect a powerful chip like this to debut in one of the most awaited devices of 2014, the Galaxy Note 4. Also, you might have noticed that all of the new processors discussed here have 32-bit CPUs, while the rest of the mobile SoC market it slowly transitioning to 64-bit, so I wouldn't be surprised if the Exynos 5433 ends up being a 64-bit CPU, perhaps a Cortex-A57/53 big.LITTLE combo.